Image courtesy of Library of Congress Reporters dubbed the 29-hour session to challenge Speaker Joe Cannon's power as the "Congress that stayed up all night." On this date, the House of Representatives “stayed up all night” during a marathon session lasting 29 hours, debating the power of the Committee on Rules. Seizing an opportunity to challenge the power of Speaker of the House Joe Cannon of Illinois, Representative George Norris of Nebraska introduced a resolution as a matter of constitutional privilege to change the House rules. His resolution removed the Speaker as chairman of the Committee on Rules and expanded its membership from five to 15, made up of groupings by state, which would effectively strip the Speaker of much of his power. Representative John Dalzell of Pennsylvania objected to the resolution, arguing that it should not take precedence over pending business. Dalzell’s objection allowed for debate to continue, and for reinforcements to be recruited through the night, until the Speaker delivered his ruling. Cannon’s fellow Republican Jacob Sloat Fassett of New York, chided his colleagues who had allied with the Democrats, saying “This is not a question of a change of rules. It is a question of a change of party control. It is a question of losing grip. It is a question of whether or not the powers of this Republican majority are to be emasculated by an unnatural and foreign alliance with our natural born enemies.” “Insurgent” Republican Congressman Henry Allen Cooper of Wisconsin responded, “They have shouted ‘party,’ ‘party,’ as though an honest effort to amend the rules of this House to be branded traitor to his party . . .They give more power to the Speaker than is accorded the presiding officer of any other legislative body in the world.” On March 19, 1910, facing inevitable defeat and personal humiliation Cannon nevertheless sustained Dalzell’s point of order. 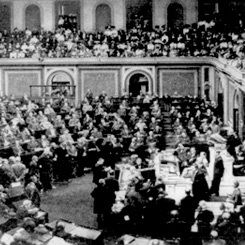 His decision to reject Norris's resolution was appealed to the House and overturned, and Norris’s resolution was adopted, breaking the deadlocked session and weakening Cannon’s iron-fisted rule.